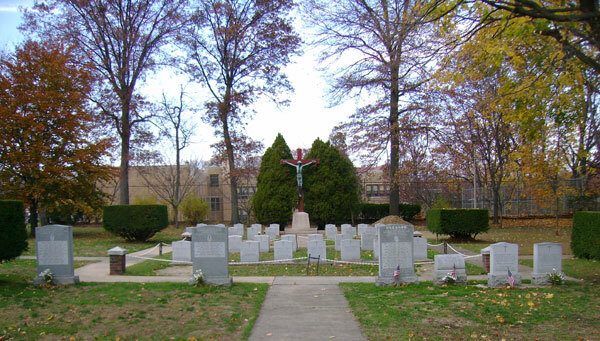 This cemetery is on the grounds of Immaculate Conception parish in Jamaica Estates, Queens, and is exclusive to members of the Passionist order. The Passionists founded the parish in 1924, when they purchased 16 acres of hillside property and established a monastery, church, school, and gardens. The cemetery has been used since the 1960s as a burial place for senior priests from Immaculate Conception Monastery and elsewhere. The small cemetery contains the graves of about 70 Passionist priests and brothers. Dates on the headstones range from 1961 to present. 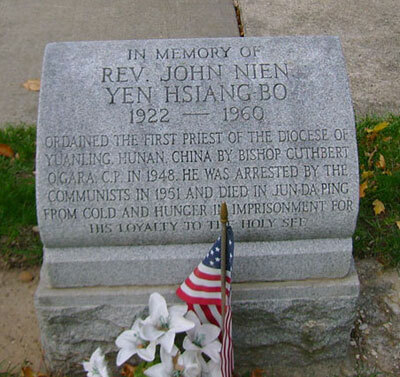 In addition to the graves, the cemetery has memorials to a number of Passionist missionaries who died overseas. Among those buried in the Passionist Cemetery is Rev. 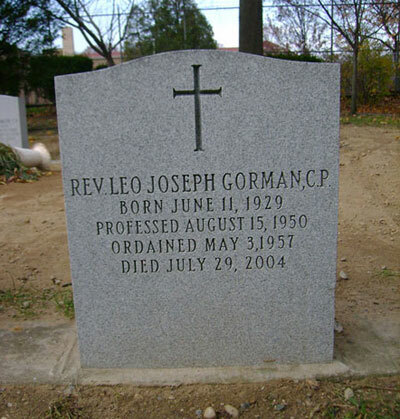 Leo Joseph Gorman, who for many years hosted “The Sunday Mass” syndicated television program. 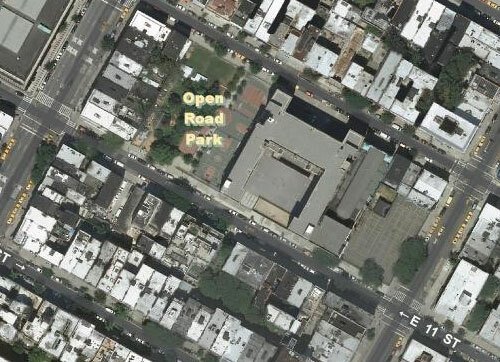 Sources: Jamaica Estates (Carl Ballenas 2010); Carl Ballenas, personal communication, Sept. 1, 2010; NYCityMap. 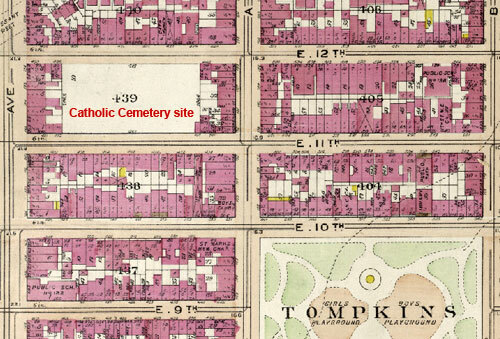 Controversy erupted in 1883 when the Trustees of St. Patrick’s Cathedral announced plans to remove their cemetery at 11th Street, between 1st Avenue and Avenue A in Manhattan’s Lower East Side, so that the land could be sold. 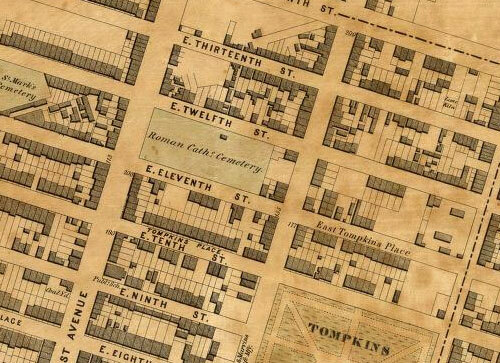 The cemetery, which extended to 12th Street and occupied most of the block, was opened in 1833 to serve the city’s Catholic community after the burial ground around St. Patrick’s Old Cathedralreached capacity. Fifteen years later, the 11th Street Catholic Cemetery was also full and burials there ceased after the church opened Calvary Cemetery in Queens in 1848. 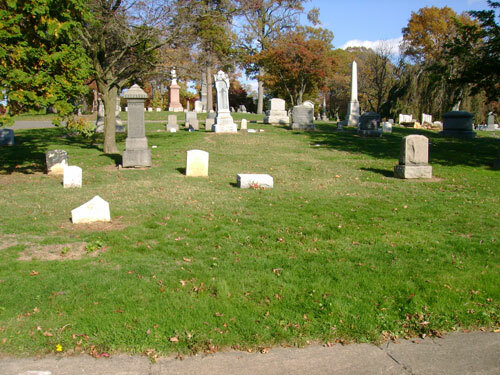 According to an 1899 article written by Archbishop Michael Augustine Corrigan, over 41,000 interments were made in the 11th Street cemetery between 1833 and 1848. Many lot-holders opposed disturbing the graves of their relatives, contending that the cemetery was sacred ground and that selling it would be sacrilegious. Among the opponents was attorney Arthur J. Delaney, who had several family members interred in the cemetery. Delaney obtained a temporary injunction preventing the removals, claiming that lot-holders, as purchasers of burial rights, had a perpetual interest in the ground that would be violated if the bodies were moved and the cemetery sold. The State Supreme Court dissolved the injunction shortly after its issuance, saying that payment for interment in a cemetery gives no title to the land, only the rights to be buried and remain undisturbed for as long as the cemetery continues to operate and to have one’s remains removed and properly reburied in a new burial place once the ground ceases to be used as a cemetery. Another 25 years passed before removal of the cemetery was carried out. The church met with opposition again in 1907 when it resolved to proceed with the disinterments, but the graves were finally removed in 1909 and the remains of an estimated 3,000 to 5,000 individuals were reinterred in Section 4B at Calvary Cemetery. 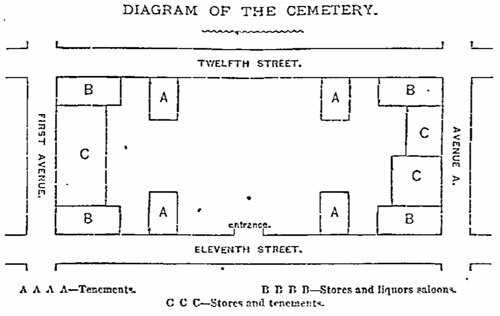 It is not known what happened to the remains of the tens of thousands of other individuals that were said to have been interred in the 11th Street cemetery. The property at 11th Street was sold in 1912; East Side Community High School, Open Road Park, and Mary Help of Christians Church occupy the old cemetery site today. Sources: Dripps’ 1852 Map of the City of New-York extending northward to Fiftieth St; Bromley’s 1911 Atlas of the city of New York, borough of Manhattan Pl.12; NYCityMap; A brief sketch of the early history of the Catholic Church on the island of New York 119-120; “The Catholic Cemeteries of New York,” Historical Records and Studies 1, 374; “Excited Roman Catholics: The Proposed Removal of Dead Bodies from a Cemetery,” New York Times Jan 4, 1883; “Selling the Graves,” New York Herald, Jan. 5, 1883, 6; “The Cathedral Cemetery Case,” New York Times Jun 5, 1883; “Catholics to Abandon East Side Cemetery,” New York Times Feb 3, 1907; “Give Up An Old Cemetery: Catholic Burying Ground in East Eleventh Street to be Abandoned,” New York Times Mar 28, 1909; “Sell Old Catholic Cemetery at Last,” New York Times, Nov 7, 1912. Dutch Jake, Jacob Johnson, elderly colored resident of the Alley, was buried in the colored burying ground near Rocky Hill, which he had reserved for the use of his brethren when disposing of a piece of property he owned in that vicinity. (Flushing Journal, Nov. 12, 1870, p. 2). 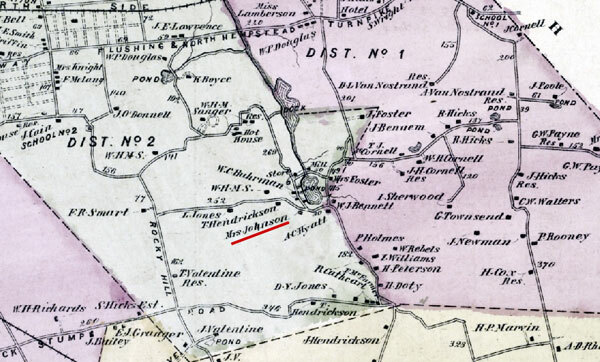 An 1873 map of Bayside, including the area that is referred to in the notice, identifies a “Mrs. 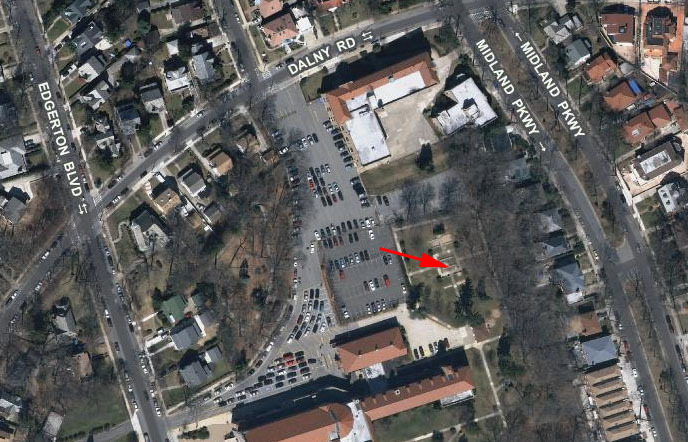 Johnson” located in the vicinity, but the burial ground is not shown. 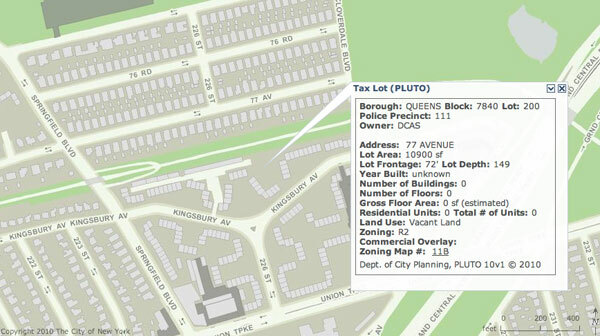 Property records for the Alley Pond Owners Corp. apartments, which were built just after World War II, specifically exclude the “quarter acre burial ground plot” from the apartment complex and describe the burial ground as located 14.39 feet south of the Long Island Motor Parkway Trail, with a depth of 149 feet and a frontage of 72 feet. 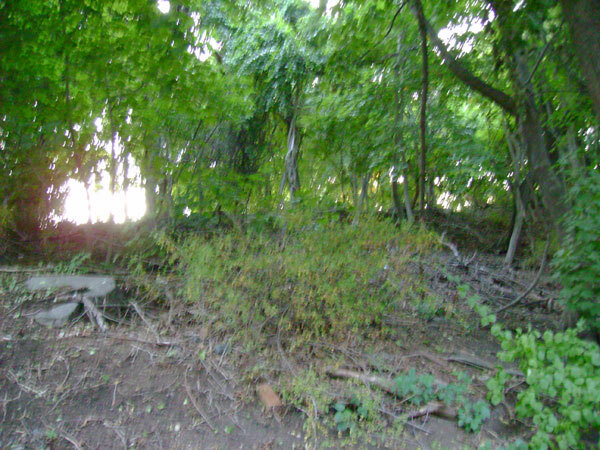 Currently owned by the city, the site is unmarked, contains no headstones, and is covered with debris and vegetation. L’Eglise du Saint Esprit, the French Protesant Church in Pine street, opposite the custom-house, was founded in the year 1704 . . . In our day it has been demolished, its dead removed, and the venerable sacred place, like many others in our busy city, is now devoted to mammon. Lawyers’ offices, custom-house brokers, a restaurant and lager-bier saloon, occupy the once hallowed spot. A high-rise building now occupies the site. The congregation of the French Church of Saint Esprit worships today in uptown Manhattan. Sources: Bridges’ 1807 Plan of the city of New-York; The Earliest Churches of New York and Its Vicinity (Disoway 1865), 121; The Huguenot Church of New York: A History of the French Church of Saint Esprit (John A.F. Maynard 1938) 231, 256. From about 1851 to 1861, a village cemetery occupied the vicinity of present-day 125th Street and 15th Avenue, in College Point, Queens. 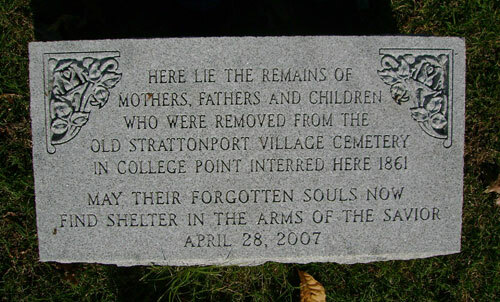 The site served as a community burial ground for residents of Strattonport, an area that was laid out into lots by land speculators in 1851 and was incorporated into the town of College Point in 1867. John Flammer, one of the businessmen who developed Strattonport village in 1851, apparently provided the property that was used for the cemetery. A map of the village from ca. 1860 (below) identifies four lots as “Cemetery given by Flammer.” These lots are shown on the south side of the Road to Whitestone (today’s 15th Ave), west of Amelia Street (125th St), extending to Wall Street (124th St). Shortly after this last notice, family members removed the remains of 20 individuals from the burial ground to Flushing Cemetery, in nearby Flushing, Queens. Flushing Cemetery recorded details about these individual removals and their records provide the only known information about individuals originally buried at the Strattonport cemetery. 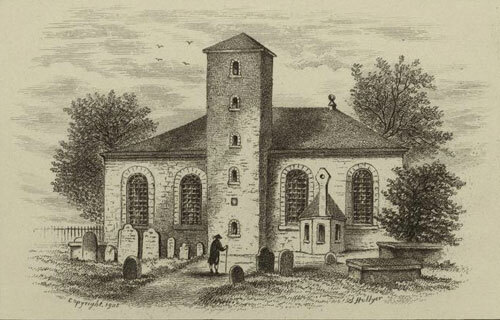 According to their records, dates of death for the named individuals removed from the Strattonport cemetery ranged from 1853 to 1859, and surnames included Baker, Bien, Boyle, Derbing, Everhart, Gruner, Holdorff, Leopold, Loerbecker, Miller, Myers, Plitt, Schneider, and Simon. On March 10, 1861, John Reed had workers remove from his property the remaining 68 bodies that had gone unclaimed. These were reinterred in two plots that he had purchased at Flushing Cemetery to serve as a common grave. 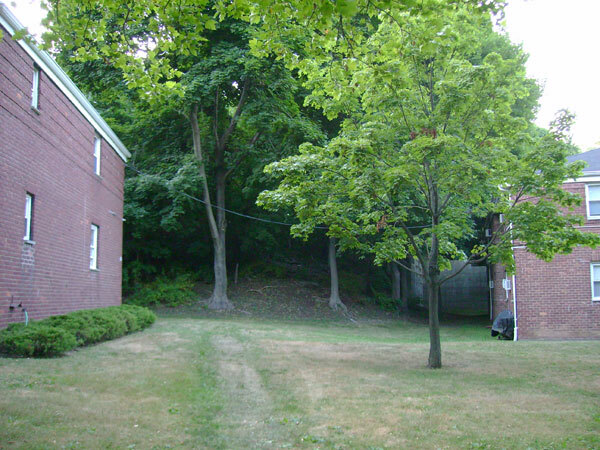 No one installed a gravestone at the reburial site when the remains were reinterred, and the gravesite remained unmarked until the Poppenhusen Institute in College Point placed a monument at the site in April 2007. 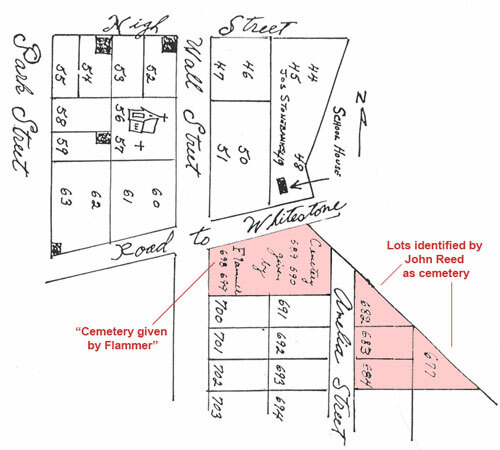 Since the early 20th century, homes have occupied both of the areas (the lots owned by John Reed and the area described as the “Cemetery given by Flammer”) near 15th Ave and 125th St in College Point that were identified as the location of the Strattonport Village Cemetery in the 1800s. Sources: Strattonport Cemetery document file, Poppenhusen Institute Archives; Map of the Village of Flammersburg, including the land called Strattonport between College Point and Flushing, Long Island (original on file at Topographical Bureau, Borough of Queens).